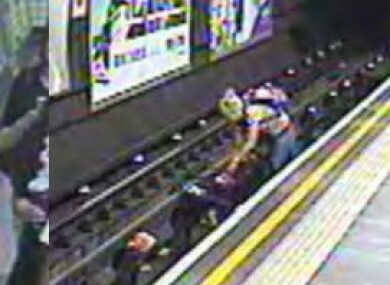 POLICE IN LONDON are appealing to the public for help in identifying a man and a woman after a child was almost killed by a train after being blown on to the London underground. According to the British Transport Police, the “near fatal incident” occurred at Goodge Street station, when a buggy containing a child was left unattended and blown by the wind on to the tracks. A man who had been pushing the pram went up the stairs of the underground station to assist what are presumed to be other members of his family. The small child was then blown on to the tracks by a gust of wind, as shown in this CCTV collage released by British Transport Police. A woman, presumed to be the child’s mother, then raced on to the tracks herself, retrieving the baby and pram just seconds before a train arrived at the platform. This was a frightening incident, not just for the scale of the danger the child was exposed to, but also because the woman then put her own life on the line by going onto the tracks. We urgently need to identify the people involved to ensure the child wasn’t injured as a result of the fall onto the tracks. Email “Baby avoids death by seconds after pram gets blown on to London underground”. Feedback on “Baby avoids death by seconds after pram gets blown on to London underground”.